Our mission is to help facilitate high quality affordable spay/neuter for feral, stray, and house pets and to provide shelter to abused, neglected, and abandoned animals. Our organization is based on the dedication of our volunteers whose duties range from cleaning & feeding at Petco (Whitehall, PA), fundraising, staffing adoption days, fostering, and much more. 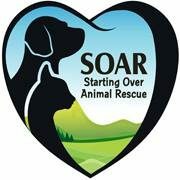 Please click the link below to follow us on Facebook, at SOAR Adoptables, to see all of our wonderful cats and dogs residing in foster homes. We appreciate any donations, no donation is too small! Please click the Paypal link below to support Starting Over Animal Rescue. We have warm fleece and Hoodies for sale! !